Divorce really messes with your mind. I know because I remember. The once intelligent together woman that I am turned into an emotional, brain-fogged, unorganized basket case. I was not at my best even though I tried very hard to keep it together. I wanted so much to sit down and focus and plan my future but felt paralyzed and surrounded by a pea-soup fog of indecision. What’s your role when it comes to the family finances? Do you handle the bill paying? Are you “in the loop” on all your bank accounts or are you in the dark? What about investment accounts or retirement plans? Do you have any? If you’re in the dark, you need someone to help you turn the lights on – and FAST! If you and your spouse are cooperative, ask for statements on all your asset accounts and your most recent tax returns so you can find a CDFA® practitioner to help you out and bring you up to speed. 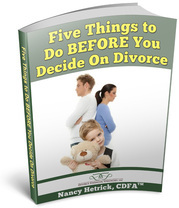 A CDFA® professional is specially trained in the financial aspects of divorce and will be your best friend in this process! He/she’ll clear out that brain-fog like a Santa Ana wind! Of course, this will be hard, but start thinking about what the next phase of your life looks like. Unfortunately this has to happen at the same time that you are grieving what you THOUGHT the next phase was going to look like. But if you allow yourself some space, it can actually be fun. You now have the chance to start over again. What did you used to dream of doing that got lost while you were married? Is it time to go back to school? Maybe a cool downtown loft condo should replace that huge family home that you had to keep clean. Whatever you dream of, you will need your budget and financial picture top of mind. That way, if your dreams outsize your wallet, you know you have some serious planning to do! Often through marriage all the credit cards, mortgages, loans, etc. are in the names of both spouses. All of those accounts will have to be closed or converted. Immediately open a checking and savings account in your own name to begin the process of establishing your own financial identity. Be sure to put some things in place while you’re still married because after the marriage is over, your credit picture may not be nearly as strong. Next, find a good rewards credit card to apply for in your name alone so that you will be assured of having access to credit post divorce and maybe even during if legal fees are necessary. These steps seem small but are valuable first steps to get you thinking financially and looking out for your future. You can get through this, and a little help from a CDFA friend is a great place to start.